Over Thanksgiving weekend I attended the San Diego Jazz Festival for the first, and hopefully not last, time. 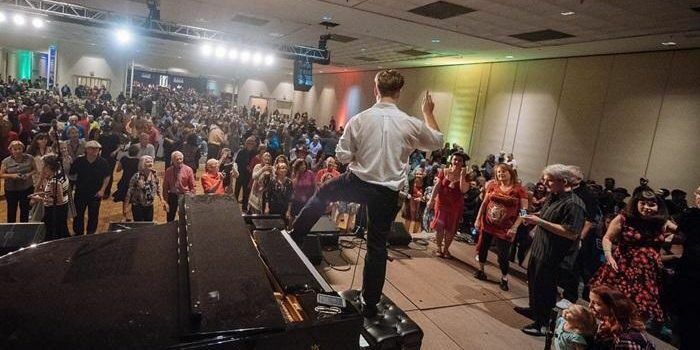 The 39th annual installment organized by America’s Finest City Dixieland Jazz Society was held at the Town and Country Hotel and Convention Center in the Mission Valley section of the city. This location is very convenient to the I-8 freeway, the light rail, numerous other hotels, and is a few miles from an Amtrak station and the airport. I had not been to San Diego in 35 years, so I arrived a day early to get the lay of the land, and to avoid flying the day before Thanksgiving. I realized early on that this piece would become too long if I included a critique of each band I heard, so I’ll instead focus mainly on the festival from an organizational and experiential point of view. I believe that will give you a better idea of what to expect if you have not been there and are thinking of attending next year. The list of bands was extensive and impressive. I tried, but was not able to hear them all. There were two that I especially wanted to catch, and took in all or most of their sets: the Original Cornell Syncopators and the Chicago Cellar Boys (a subset of my much favored Fat Babies). A couple of those I did hear did not wow me, but at least I gave them a shot. There were no fewer than 22 bands, a female vocal trio, four guest artists (mostly pianists) and pianists from some of the bands doing solo sets. All the band rooms had dance floors on either side or in front of the stage, and these were well patronized. I even noticed a few people dancing alone. I found this to be an exceptionally well organized festival. The program book listed no fewer than 153 volunteers who made it all happen, plus another 20 or so AFCDJS directors and staff members. Four of the music rooms were side-by-side, yet the sound from one did not bleed into another except when a band was silent and the doors to the lobby were open. The other rooms were within a city-block walk (indoors). The 32-page program (free to all attendees, unlike at some festivals where there is a nominal charge) was a veritable encyclopedia of everything one needed to know about the event. I especially liked the 11×17 insert which had, on one side, a chronological listing by location of all the sets, and an alphabetical listing on the other of each band’s and pianist’s sets, giving time and location. The former was also posted on the AFCDJS website, so I could rough out an itinerary before I left home. There was also a map of the premises—very helpful to this first-timer. There were other nice touches that I don’t recall seeing at other festivals. For each set, a list of that band’s or pianist’s sponsors was posted in the room. Most of the bands acknowledged their sponsors each time they played. Sponsors got reserved front-row seats for the first 15 minutes of every set, as well as special tags for their admission badges. Sponsors who were not staying at the hotel were also given free parking, which apparently was at a premium due to construction on the property. I didn’t notice that because I went back and forth from my nearby hotel by bicycle and nobody objected when I brought it inside and parked it in an out-of-the-way location. On each stage and in each room there were water jugs and/or pitchers (not single-use plastic bottles that are evidently a no-no in environmentally correct California) for the musicians and patrons. Outside each room was a sign, updated every day, of the bands and time that each was playing in that room. Every band was assigned a volunteer “caretaker” whose job was to tend to the musicians’ needs, including selling CDs, not only on stage but in the hospitality room. On Saturday afternoon there was a reception for sponsors, but I was too busy listening to the music to go. This was to be an opportunity to meet the musicians, but I wonder how many of them were able to attend the 2-hour event in a separate wing of the hotel from the performance rooms. Still, the thought was appreciated. The Original Cornell Syncopators at The San Diego Jazz Festival. Of the 22 bands, which ranged from three to twelve pieces, seven were from outside of California. Two were from the Pacific Northwest, one each from New Orleans, Chicago, Michigan, and North Carolina, and the one I most especially went to see, the Original Cornell Syncopators from Ithaca, NY. Probably due to economics, the Syncs brought only a 7-piece contingent, not the full 13 who had performed the previous Sunday at the Tri-State Jazz Society. The founder and leader, Colin Hancock, who has been profiled in this paper before, (Read It) has done a masterful job of pulling together eleven students—none of whom are music majors—and one professor into a tight ensemble that has branched out from the Original Dixieland Jass Band’s book to that of the New Orleans Rhythm Kings, the Wolverines, and some other not-well-known early ’20s jazz and dance bands. Several members, including Colin, will graduate in May, and I wonder what will happen with the band. One member told me that they have a large enough book that they could continue playing, but I believe it will take someone with Colin’s knowledge and enthusiasm to pull it all together. Having only been to one western music festival, [Read: From America’s Classic Jazz Festival in Lacey, WA] I had not heard many of the bands from that region before. I knew it would be my last chance to catch High Sierra, which had announced that it is disbanding in April after 42 years. I hope that doesn’t mean that all its members are cashing in, too. Many of the bands have been coming to this festival for many years, and most of their members are approaching or have reached senior citizen status. Being in that demographic myself, that’s not a dig, just an observation. The most notable younger exceptions were the Cornellians, Chicago Cellar Boys, On the Levee JB, Dave Bennett’s quartet and Dawn Lambeth’s trio, plus the Mission Bay High School group. The first two days of the festival—Wednesday and Thursday— had only evening sets in one and two venues, respectively. But these gave me a head start on fulfilling my goal of seeing as many groups as possible. One that I especially enjoyed was a quartet of husband and wife pianists Paolo Alderighi and Stephanie Trick (this time on two pianos) joined by Marty Eggers on bass and Kevin Dorn on drums. I marveled at how well they all synched despite not being able to maintain eye contact and not playing together regularly. Stephanie told me later that they’ve performed before as a group so they’re all well acquainted by now. The piano sets, of which I was only able to see a few, were held beginning Friday morning and continuing through Sunday afternoon in a double-wide room between the band venues. I regretted not being able to take in more of them. Saturday featured an all-day Swing Extravaganza in the largest ballroom. I dropped in briefly to see the hall mobbed with young Lindy-hoppers who apparently only attended this event. A good time was being had by all, and although the music was not strictly trad, if it brought a younger generation to the festival and possibly exposed them to trad, I have no complaints. The only complaint I do have about the festival is the high cost of on-site food. The conference center has several restaurants. I went to one and found the service too slow. The large (1.7 million square feet) upscale Fashion Valley shopping mall is a short distance away, probably walkable if you’re fleet afoot, and has a number of eateries ranging from fast food and coffee bars to fancier places. I did not go there, knowing that doing so would require missing at least one music set. There was a limited-menu food station specially set up in the lobby that I took advantage of, for people who wanted a quick, simple meal, accepting that there was a price to pay for this convenience. Retiring festival executive director Paul Daspit reported to me that total attendance this year, including musicians and volunteers, was around 5200. Deducting the “working” population, that would mean a gate of a little under 5000. I doubt that all were there at any one time, but never did I feel that the place was so over-crowded that I could not get a seat for any set or had to wait to use the restroom or get something to eat, with the one brief exception described above. So I give the festival an “A” for crowd management. The tentative roster of this year’s festival (Nov. 27-Dec. 1, 2019) has been announced, and includes, so far, 14 bands from this year. It is not too soon to make reservations at the hotel (or at any hotel of your choice) and sign up as a sponsor, which gets you the same perks that sponsors got this year. Bill Hoffman is a travel writer, an avid jazz fan and a supporter of musicians keeping traditional jazz alive in performance. He is the concert booker for the Tri-State Jazz Society in greater Philadelphia. Bill lives in Lancaster, PA. He is the author of Going Dutch: A Visitors Guide to the Pennsylvania Dutch Country, Unique and Unusual Places in the Mid-Atlantic Region, and The New York Bicycle Touring Guide. Bill lives in Lancaster, PA.